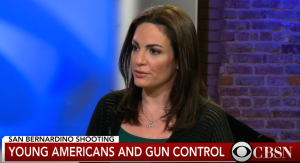 • “US guns: journalist,” As It Happens with Carol Off and Jeff Douglas, Canadian Broadcasting Company, Dec. 4, 2015. 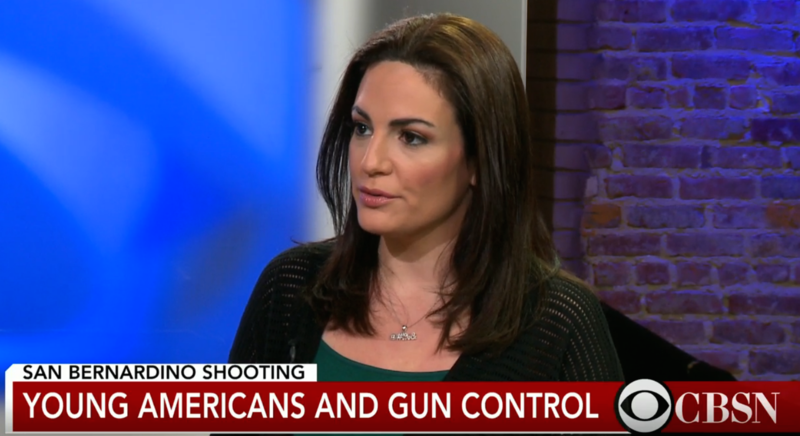 • A Mobster’s Daughter Wants to Talk to Teens About Guns, TED Blog, Nov. 15, 2014. 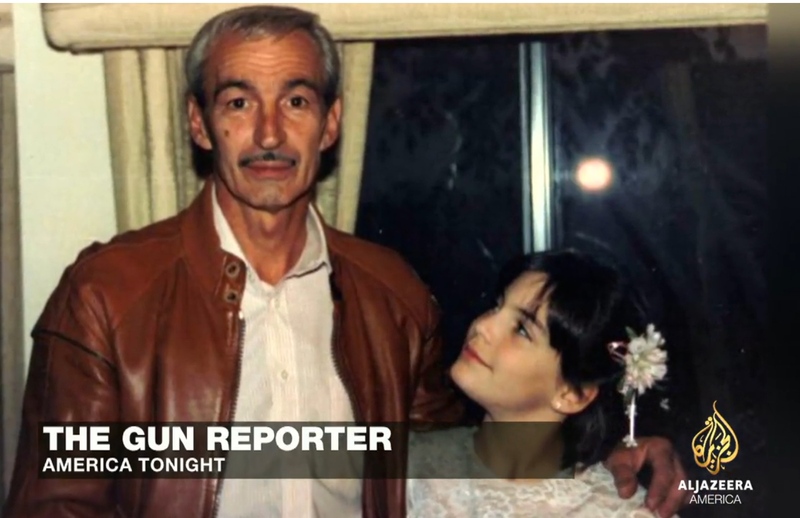 • “America’s best hope for tracking gun deaths is a mob enforcer’s daughter,” America Tonight, Al Jazeera America, March 6, 2015. • “The End of the Gun Report,” On the Media with Brooke Gladstone, WNYC, July 18, 2014. • “‘Everyday there’s a scourge of handgun violence’ across the U.S., Jennifer Mascia tells Newsday,” BBC World Service, July 17, 2014. • “Facing the Real Gun Problem,” New York Review of Books, June 20, 2013. • The Approval Matrix, New York Magazine, June 17, 2013. • Readers Mourn the Loss of The Gun Report, Public Editor’s Journal, The New York Times, June 18, 2014. • The Times Killed Its “Gun Report” After the Writer Asked for a Raise, Gawker, June 20, 2014. 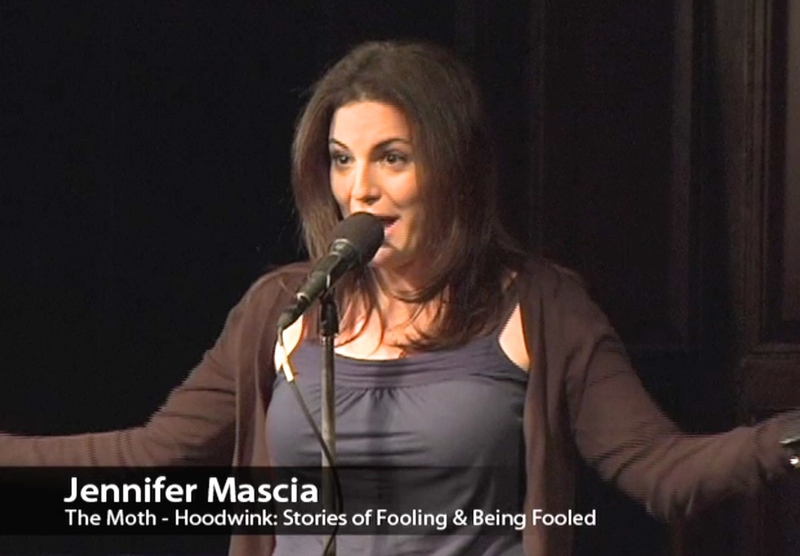 • The Moth: “Just Business,” a woman makes a series of discoveries about her family’s past.” Aired Oct. 14, 2014. Presented at the National Arts Club in April 2010. • HuffPost Live: “Are We Responsible for Our Parents’ Bad Decisions?” Feb. 20, 2015. • Discussing the 98th Neediest Cases campaign on NY1, Dec. 19, 2009. • “From Waitressing to Writing at the New York Times,” Community College Success, March 25, 2012. 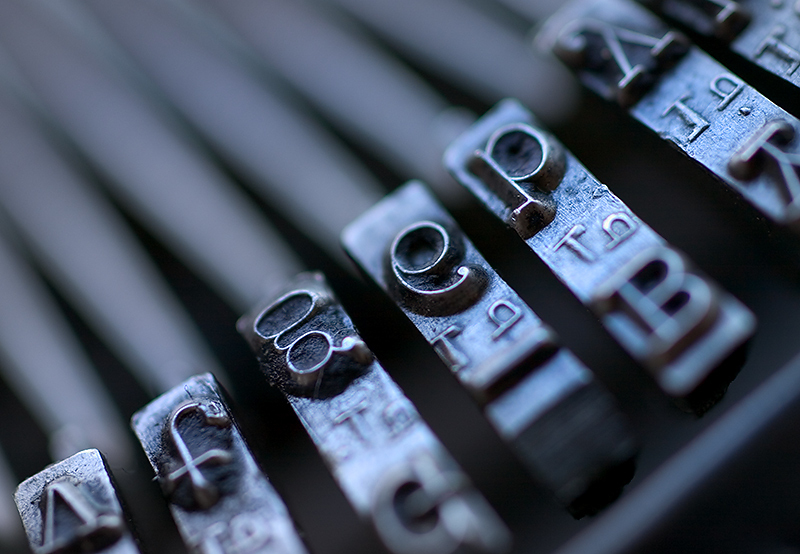 • CeliaBlue.com: A Word About Writing: A Series of Brief chats With Writers, March 5, 2012. • NPR: Talk of the Nation with Neal Conan: What It’s Like to Live on the Lam, Oct. 4, 2011. • New York Magazine: A Breakdown of the Titles Gracing Elaine’s. May 22, 2011. 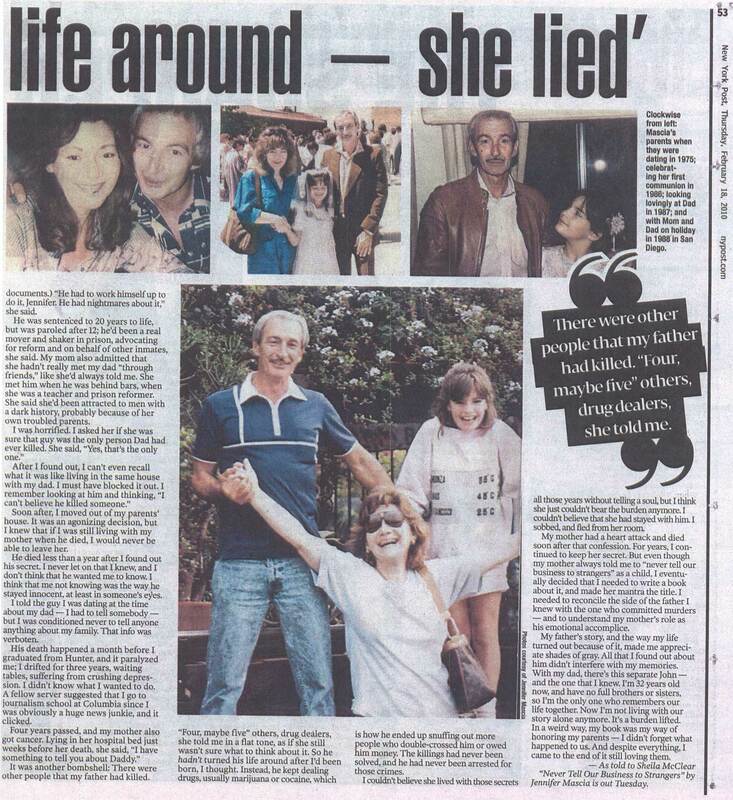 • The Times of London: My Dad, the Mafia Hitman, April 18, 2011. • CBC: Definitely Not the Opera: “Family Secrets.” March 12, 2011. • BBC News: “Can the FBI Take Down New York’s Mobsters?” January 20, 2011. 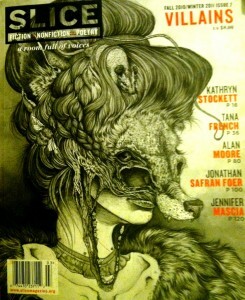 • Slice Magazine: An Interview with Jennifer Mascia, Issue 7: Villains, Fall ’10/Winter ’11. • BBC World News, First Person: “My Dad Worked For the Mafia,” Sept. 1, 2010. • “Hit Man’s Daughter Recalls Her Family Life on the Lam,” June 30, 2010. Bloomberg review by Robin D. Schatz, picked up everywhere from Arizona to Qatar. • Recommended Reading, King Features Weekly Service, reviewed by Katherine Burns Olson, May 10, 2010. • CUNY TV: “Study With the Best” with host Barry Mitchell. 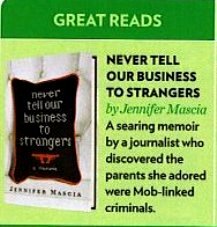 • People Magazine: “Great Reads,” Mar. 22, 2010. • Elle Magazine: Elle’s Lettres, #1 Reader’s pick for April, March 8, 2010. • The District Dish, Washington, D.C. lifestyle talk show, March 30, 2010. • Rowan University: The Women’s Room, June 17, 2010. 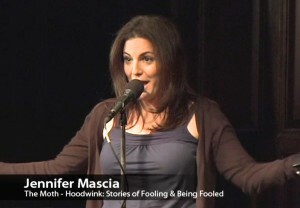 • Interview with Jennifer Mascia, skirt! magazine, June 28, 2010. • Book Recommends July 2010, Moncrieff! with Sean Moncrieff, Newstalk Radio, Ireland, July 2010. •Florida Weekly: Summer Reading, May 27, 2010. • Dresser After Dark, March 21, 2010. • The Mimi Geerges radio show, March 21, 2010. • The Chicago Sun-Times: “Secrets and lies, from her parents: Author unravels, and spills, family ‘Business,'” Feb. 28, 2010. 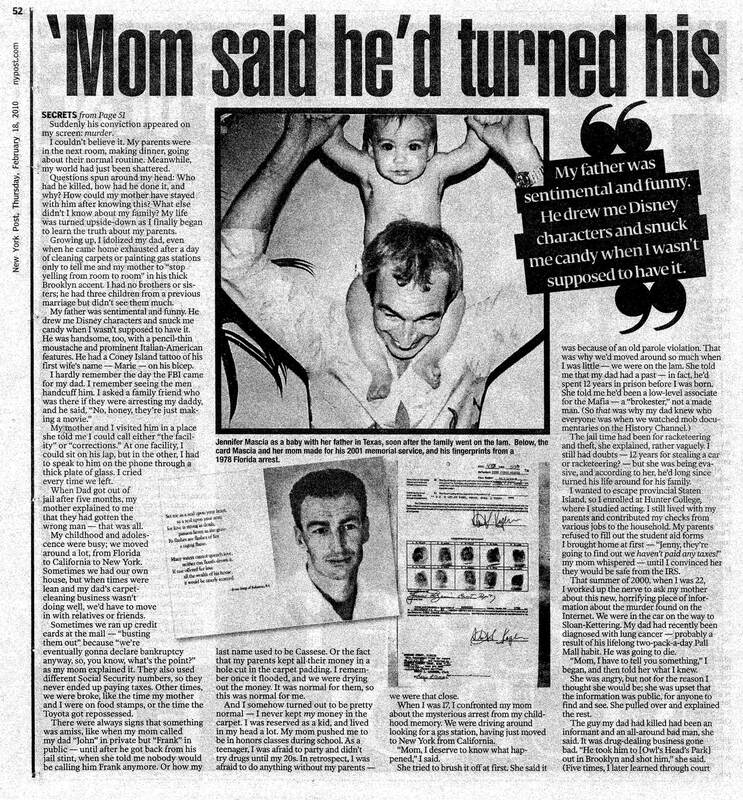 • The New York Post: “My Dad Was a Secret Murderer,” Feb. 18, 2010. PDFs: Page 1, 2, 3. • 21 Questions, NYMag.com, Daily Intel, March 3, 2010. • This Week’s Hot Reads, The Daily Beast, March 10, 2010. • TresSugar: Best Books of March 2010. • Yahoo! News: NY Times staffer’s book details dark family secrets, March 24, 2010. 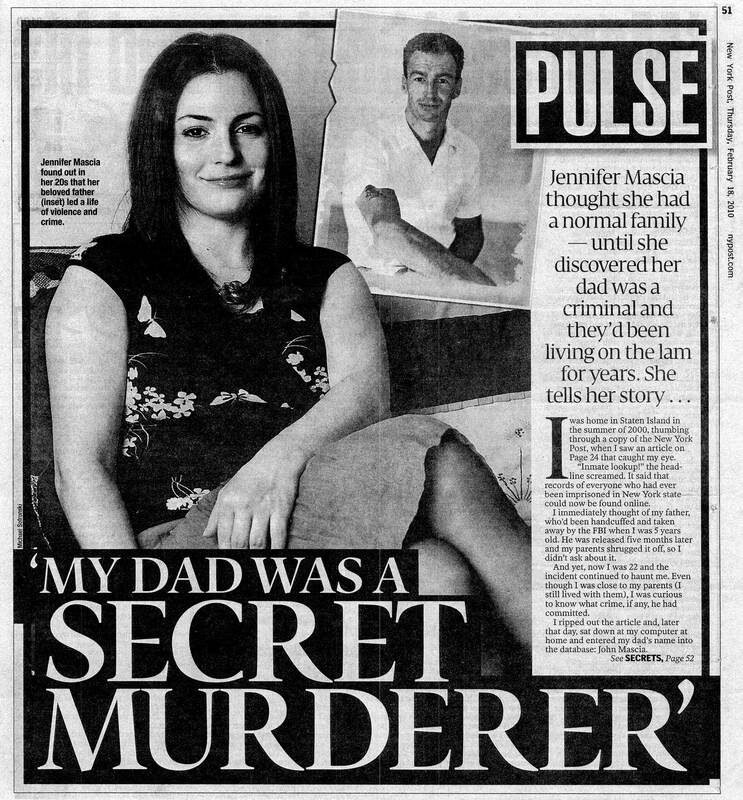 • EarlyWord: “Keep an Eye on Jennifer Mascia,” Feb. 19, 2010. • KMOX-AM, St. Louis, “The John Carney Show,” Feb. 25, 2010. • The Doree Chronicles, March 3, 2010. • The New York Observer, “Modern Love Breeds Book Deals,” Feb. 5, 2008. • Cheryl’s Book Nook, March 29, 2010. • Glamour, Germany, Spring 2007. • GalleyCat: “Newsroom Assistant Lands Sunday Feature, Book Deal,” Aug. 28, 2007.